I work in the field of agriculture, that’s not anything new to any of you. It would be easy to assume my views towards the industry are slanted or biased to be pro-agriculture. While there maybe some truth to that statement, it’s also important to know I did not grow up knee-deep, sleeping, and breathing agriculture. I chose to be here. I was born in the city, grew up in the suburbs, and landed smack dab in rural Northeast Oklahoma my freshman year of high school, in a place I call my “Water Tower Town.” I was never in 4-H, I didn’t show livestock until my sophomore year of high school, and I didn’t own high-top cowboy boots until I was 18. However, I do have two college degrees in agriculture, five years of FFA membership, and was fortunate enough to be blessed with a Great-Grandpa and Grandpa to introduce me to livestock and horses before I could walk, and a Dad who taught me to how to operate everything from backhoes in the small backyard of my suburban childhood home to tractors in the pasture of my teenage years in Water Tower Town. I am extremely proud of my diverse background, I’ve always believed it gives me the ability to better explain the world of agriculture to those who prefer asphalt under their feet. No question is a stupid question, if you don’t know then the best way to find out is to ask. I’ve answered everything from, “Is a sweet potato just a different colored regular potato?” to “Why are cows different colors?” to “What is Tyson’s stance on organic meat?” If I don’t know, I will find out for you. The good thing about the world of agriculture is someone knows someone, who has the information you need. With all this being said, it’s time to get down to brass tax of why this post is important to me. Yesterday, I was reading a CBS drought article about cattle producers in Arkansas. (click here to read it) After I finished reading, I clicked on the comment section. It’s something I always do on ag articles to see if anyone I know has commented or if there is any wrong information being spread. That’s when I found this little jewel, and the first comment under the article. (You should probably read the article to fully understand what this person is referring to.) He then followed up with this… I could break all of this down, and explain how wrong he is on, well, 99% of his comment, but this would turn into a novel, and it doesn’t take much to realize how swayed in one direction he is. Let me start by saying I personally do not have a problem with vegetarians or vegans, one of my close high school friends leads a vegan lifestyle and we get along just fine. They still have to eat, so they still contribute to the agriculture industry. Also, I am very soft-hearted. I can barely discipline my own dog, let alone abuse an animal. We love our babies! 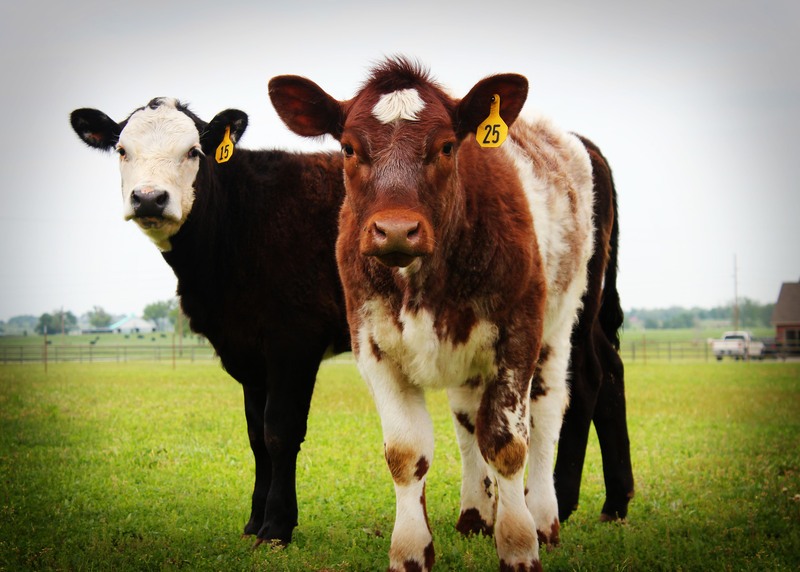 These little girls are out of two of my sister’s past show heifers. Both mamas and babies believe they rule the pasture. What I do have a problem with is the people like the one in the comments above. How could someone wish this horrible drought on anyone? Lets take away the hardship it places on producers and focus solely on animal welfare. This drought eliminates water sources, forages to graze, makes hay scarce to bale, therefore causing this winter’s outlook to be a nightmare, decreases animal health, and increases the spread of sickness. THIS is why I chose ag for a career. To educate the public, to be an Agvocate, and to work in a field that I am passionate about. So while I will probably never be able to change Newster90210’s views on the agriculture industry, maybe I can help someone else understand the “what, where, when, why, and how” of farming and ranching America. Any questions about Agriculture, or maybe how I can clear up any of Newster90210’s points, comment below, and I will be sure to answer to the best of my ability or consult with someone who will have an answer. This another prime example of pure, deliberate ignorance. It makes me so annoyed that these people sound off against thousands of agriculturists who work every day to treat animals humanely, and they can sway public opinion from behind the guise of a screen name. They have a right to not agree with eating meat, but accusing someone of murder for profit, that’s much more serious then a rightful opinion. It’s harmful and unnecessary slander. He probably wouldn’t like it very much if we got our own screen names and attacked his chosen career. A beautiful post friend! 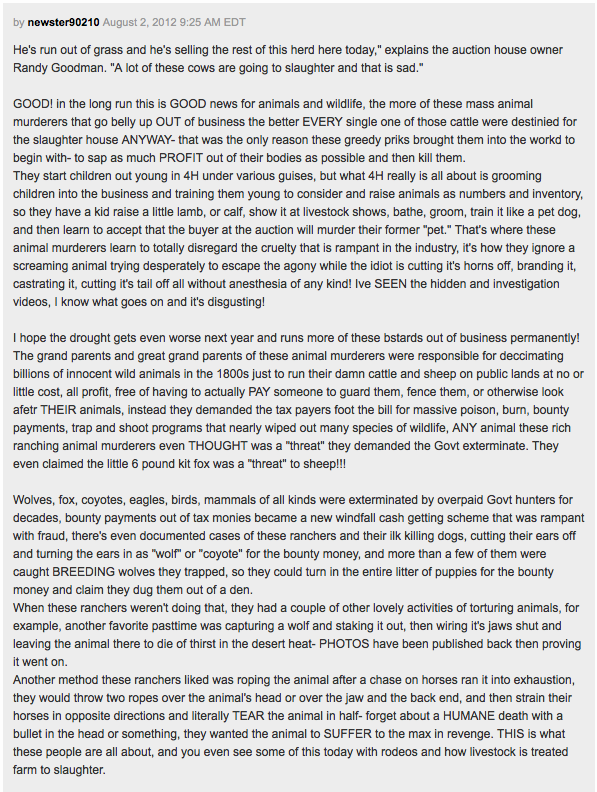 I wonder – did this person mention what would happen to the cattle if they were free roaming and a drought hit? Their water supplies would be drying up, lack of food, no one to painstaking supply these things – they would simply be dying a slow, agonizing death. Is that better than living a well cared for life and then entering the food supply in the most humane way possible? We know where I stand, but I wonder what this person would say.